Ceasefire? Not for sure. Palestinian gunmen waged a street battle outside the Gaza residence of President Mahmoud Abbas around dawn Monday, but there were no reports of injuries. During the morning hours gunmen from Hamas and Fatah faced off in a gun battle in the middle of Gaza City, a battle that left a teenager wounded. About 10 masked Hamas gunmen, with rifles, grenades and rocket launchers, took shelter behind walls in downtown Gaza as they fought a dozen other gunmen from Fatah, witnesses said. The fighting wounded a 16-year-old boy with a bullet in the neck. Amidst reports on a ceasefire agreement reached in the Palestinian Authority Sunday evening and on the backdrop of violent night clashes between Fatah and Hamas gunmen around the parliament building in Gaza, Abbas' office and the home of Fatah official Muhammad Dahlan, official sources in both movements denied that a truce had been reached. Four people were injured in the clashes. Earlier, Palestinian sources reported that Fatah and Hamas representatives reached an agreement on a ceasefire and on halting the violent incidents in the Palestinian Authority, with the assistance of the Egyptian security delegation visiting the Strip. According to the report, the parties hope that the agreements will be translated into real activity in the field, and that the activists will be calmed down. Salah Zidan, commander of the Democratic Front for the Liberation of Palestine in the Gaza area, even told al-Jazeera that his organization worked in favor of the ceasefire. He said that according to the agreement, all gunmen must withdraw from the streets. Senior sources in Fatah and Hamas confirmed at first that a ceasefire agreement had been reached. According to Hamas representatives, as part of the agreement it was decided to resume the talks for the establishment of a unity government, stop carrying weapons in public in the streets, return the security forces to their headquarters and release the people kidnapped on both sides. The Egyptian security delegation continues to hold talks with the parties in hopes of reaching a stable ceasefire, although reports from the Strip painted a picture of a serious escalation and a real civil war. On Sunday evening it was reported that gunmen fired another rocket at Palestinian President Mahmoud Abbas' office and that an activist was killed in the northern Strip town of Jabalya. The activist, an officer in the Palestinian national security force, was shot to death by unknown gunmen in Jabalya. After he was shot, his body was thrown in the street. The man, Hamdi Rahma, is the brother of a senior officer in the Palestinian Preventative Security Service. This was the third person killed Sunday in the PA clashes. 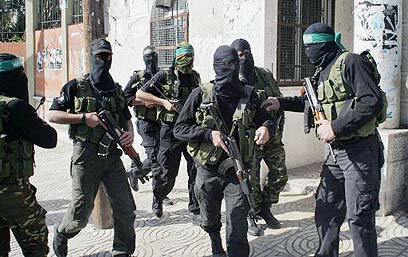 Earlier, Fatah activists kidnapped two Hamas members. About 15 people were injured in clashes in the PA in the past 24 hours. Exchanges of fire also took place near the office of Palestinian President Abbas in Gaza City. Palestinian security sources reported that three mortar shells were fired at the offices. The Palestinian president himself was in Ramallah at the time and was not hurt. In the afternoon, Palestinian sources reported that gunmen opened fire at a procession organized by the Fatah movement in the northern Strip. The demonstration, which was held in support of Abbas, turned into a show of force by dozens of Fatah activists and supporters. Meanwhile, about 4,000 gunmen from the Presidential Guard and the al-Aqsa Martyrs' Brigades took over the Transportation and Agriculture Ministries in Gaza. Hamas referred to the incidents as a "military coup," and Palestinian Foreign Minister Mahmoud al-Zahar demanded that the offices be evacuated. According to him, if the gunmen fail to leave the ministries they would be arrested and disarmed. "What is happening is a real military coup – assassinations, assassination attempts, and a seizure of headquarters and government offices," al-Zahar said in a press conference. Meanwhile Sunday evening, Prime Minister Ehud Olmert visited the Israel Defense Forces' West Bank Division along with Defense Minister Amir Peretz and IDF Chief of Staff Dan Halutz. Olmert met with senior officials at the Central Command and was briefed on the routine security activity, on the recent developments in the PA and on the lessons learned from the war in Lebanon. He later referred to the violence in the Gaza Strip, saying that "we have to closely examine what is happening on the other side." The prime minister added that "there is nothing more appropriate than aiming for a diplomatic agreement, this is the objective. We have to think how we are going to influence the other side's quality of life and economic situation. There are those who are not involved in terror and we have to work to strengthen the moderate forces." See all talkbacks "Hamas, Fatah reach agreement on truce; Gaza on fire"